On Wednesday, 23rd 2018 English Department study Program Faculty of Teachers Training and education Muhammadyah University of Tnagerang has conducted the one day International Workshop. there are three speakers in the workshop. Dr. Robert J. Dickey as a keynote speaker, Ikhfi Imaniah, M. Pd and M. Abduh Al-Manar, M. Pd as speakers. The workshop was attended by vice mayor of Tangerang, Drs. H. Sachrudin, Rector of UMT, Dr. H. Achmad Badawi, S.Pd S.E, M.M and dean of Faculty of Teacher Training and Education Dr. Enawar, S.Pd, M.M. It was also attended by 350 students from English Education Study Program. 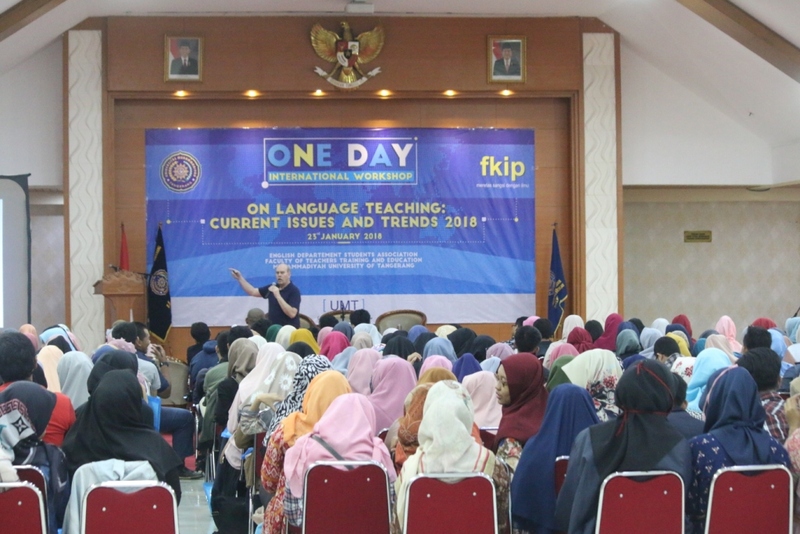 "One day International workshop on Language teaching: current issues and trends 2018." is chosen as a theme, the aim is to give students knowledge about the use of methods, strategies, and media on language teaching of currents issues and trends 2018.